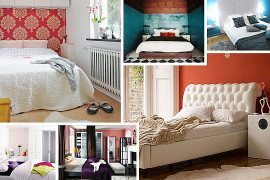 Ready for a little bedroom design inspiration? Kate here, and I’m in the middle of a bedroom makeover of my own. Today I’m rounding up some of my favorite ideas and showcasing today’s top modern design trends. Below you will find a collection of beautifully curated spaces that reflect the benefits of a balanced interior. 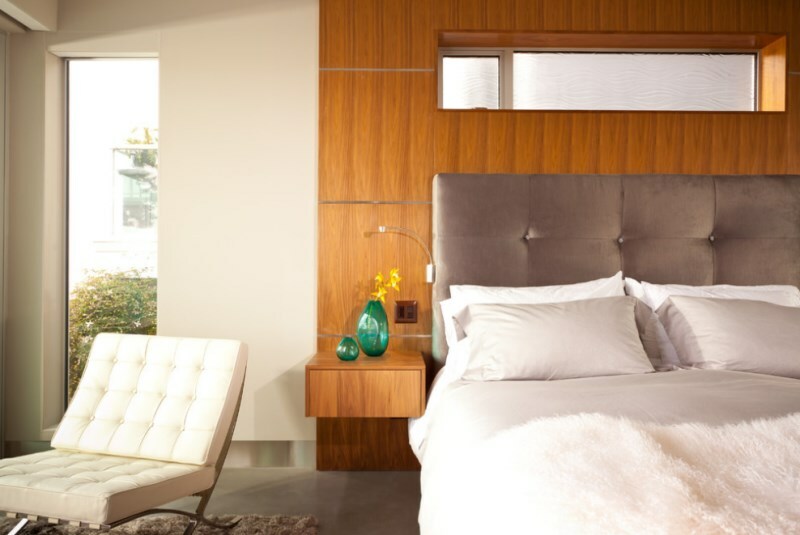 And when I say “balanced”, I mean stylish, decadent, uncluttered and functional–everything your dream bedroom should be! Let’s get started, shall we?! I’d like to begin by highlighting some of today’s top design trends. It’s always fun to keep up with the latest in modern interiors, and it’s a great way to search for standout ideas. One of my very favorite designers is Rafael de Cárdenas of Architecture at Large. 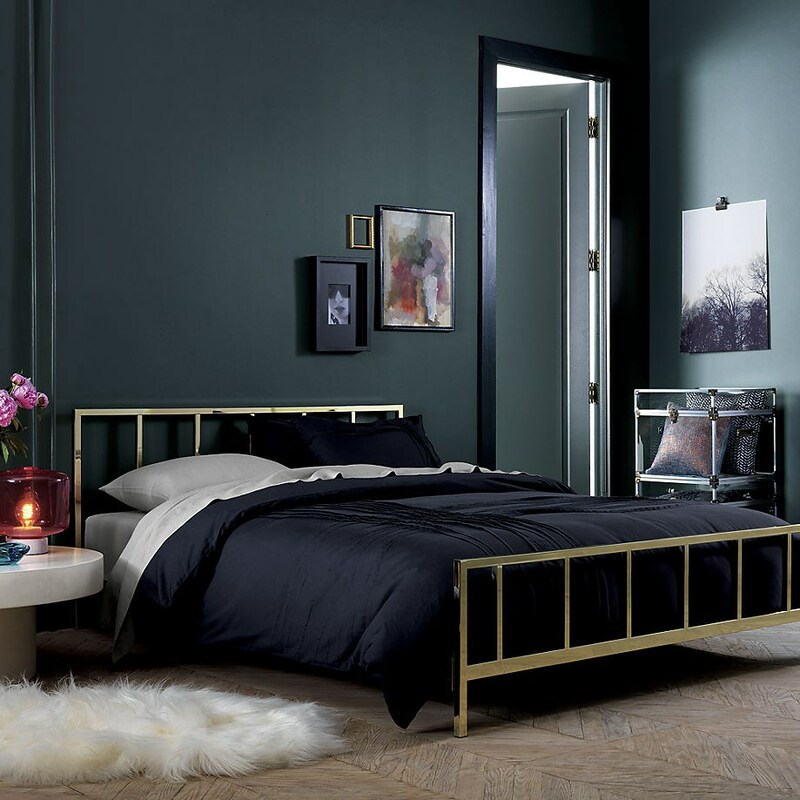 Below we see one of his bedroom creations, complete with a soothing color palette and a retro-meets-modern look. This space is the epitome of modern elegance. It has an upscale feel, yet it’s also inviting. There are unexpected elements, such as bright pops of color and geometric touches. Not to mention, it’s very pulled together yet completely unique. See more of Rafael de Cárdenas’ work in this post. Speaking of lighting, large pendants have continued to maintain their appeal, especially when they showcase unique forms. 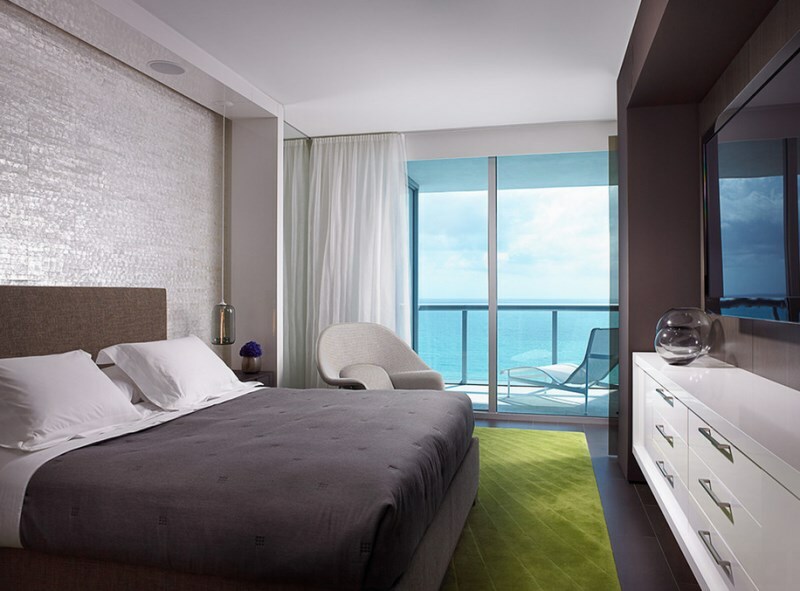 The wooden pendant light below hangs over Mahalo Red-Orange Bed Linens from CB2. 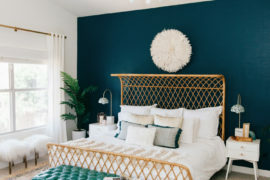 The color combination in this space is modern with a hint of tropical style! Geometric pendant lighting is also extremely popular this season, as shown in this modern space below from Ferm Living. 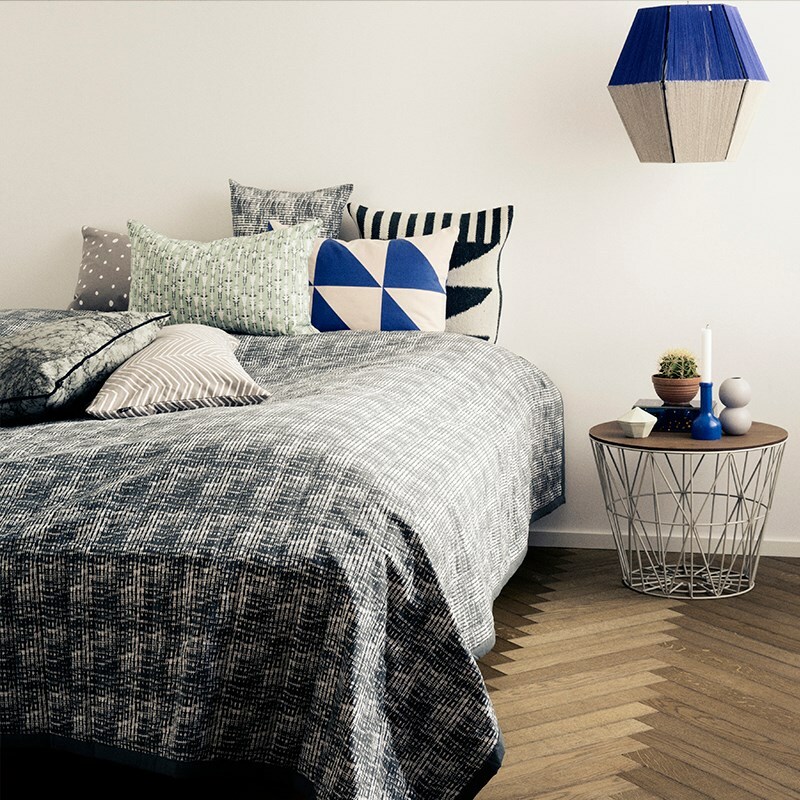 Not to mention, the textiles are unforgettable, as is the wire table by the bed–another strong design trend this season. Grouping pendant lights is a great way to make a big impact. 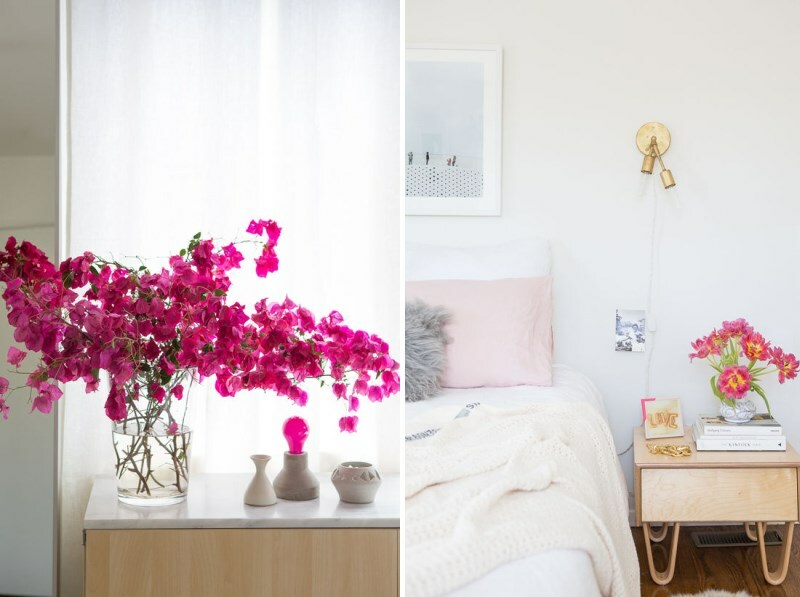 The next photo is from the bedroom of A Beautiful Mess blogger Emma Chapman. 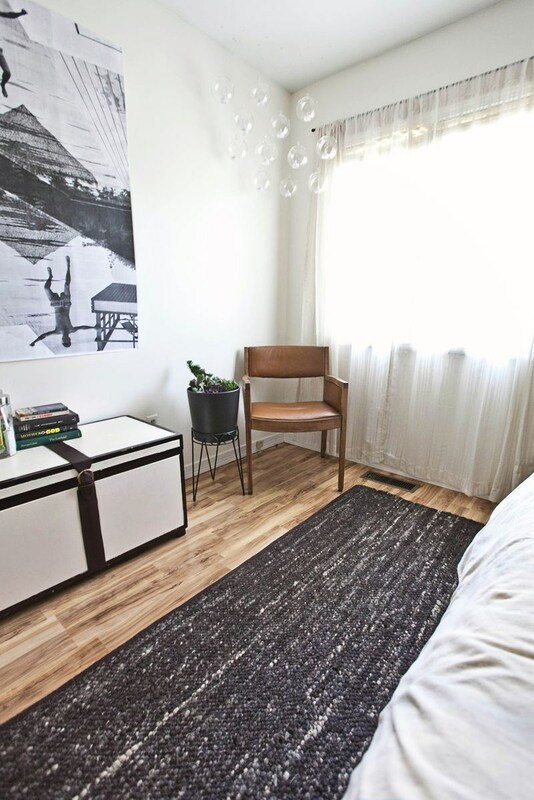 This creative corner proves that every square inch of your space can reflect your style. 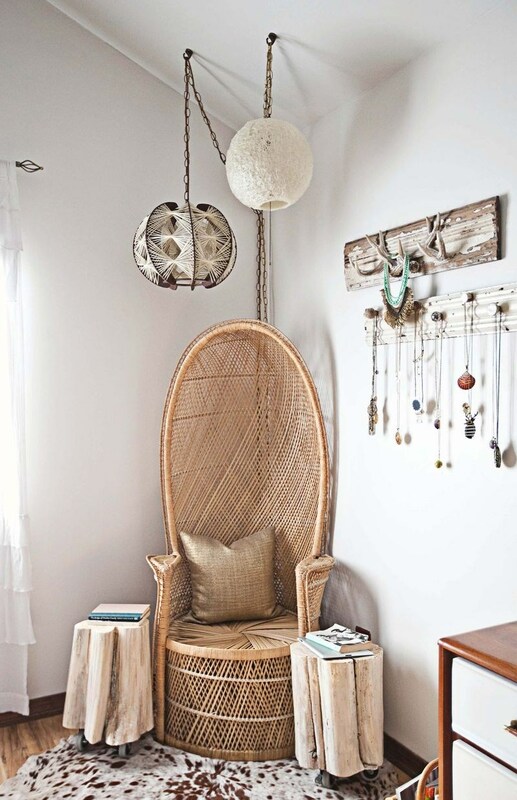 From the grand seating to the stylish jewelry storage solution, this nook is comfy yet functional. And if you’re curious about those tree stump side tables, they are one of many amazing DIY projects featured at A Beautiful Mess! We’re just not ready to leave the home of Emma Chapman yet, folks! 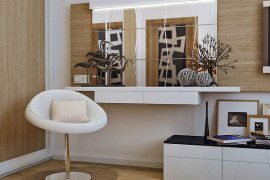 That’s because she infuses her space with breezy modern style. Everything is relaxed yet impeccably pulled together. Below we see a shot of her guest room, which is full of personalized details. Once again, we see a corner filled with creativity. The succulent planter is a wonderful touch, but my favorite is the grouping of Whirly Hanging Candleholders from CB2. Emma filled them with flameless candles for a safe alternative to open flames near the draperies. 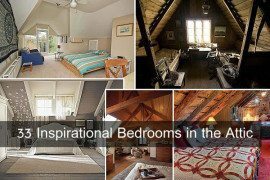 Her space reminds us to get creative in the realm of bedroom design. DIY projects and clever decor decisions can truly make a space. 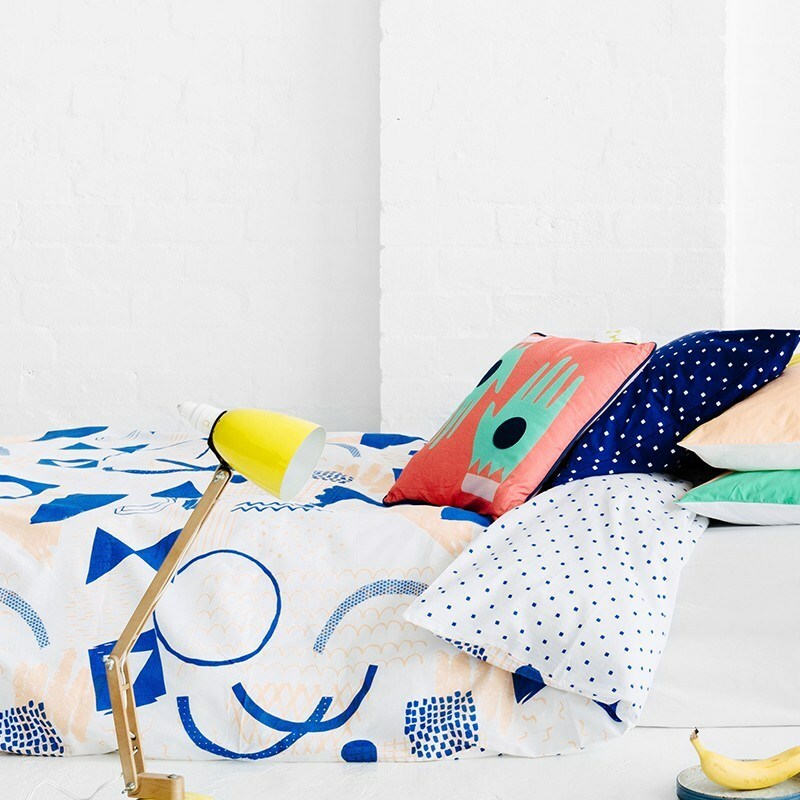 There’s something happening in today’s world of bedding. 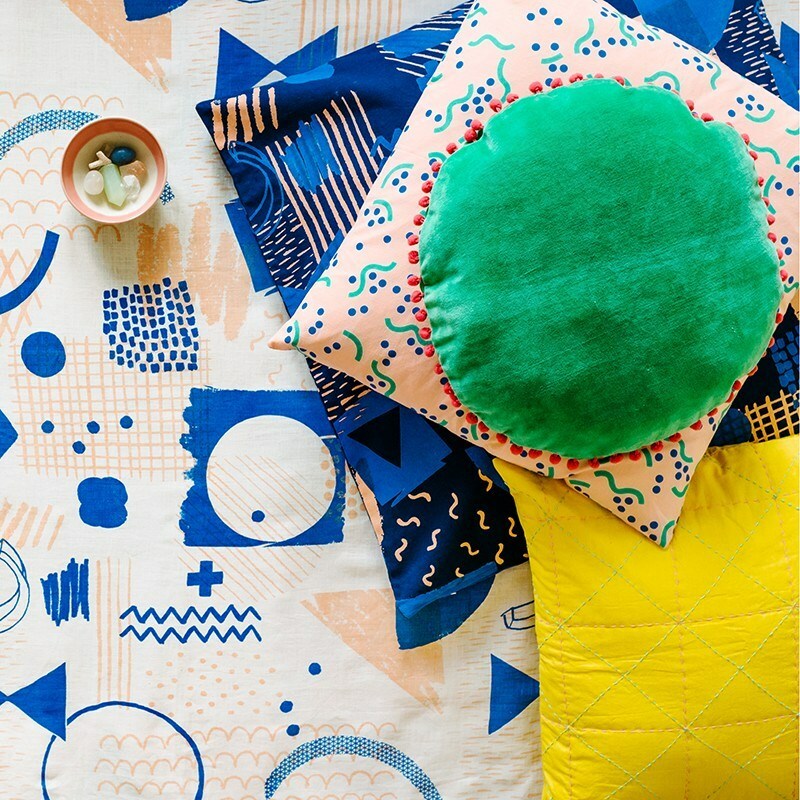 It’s like textiles are responding to a colorful wake-up call. 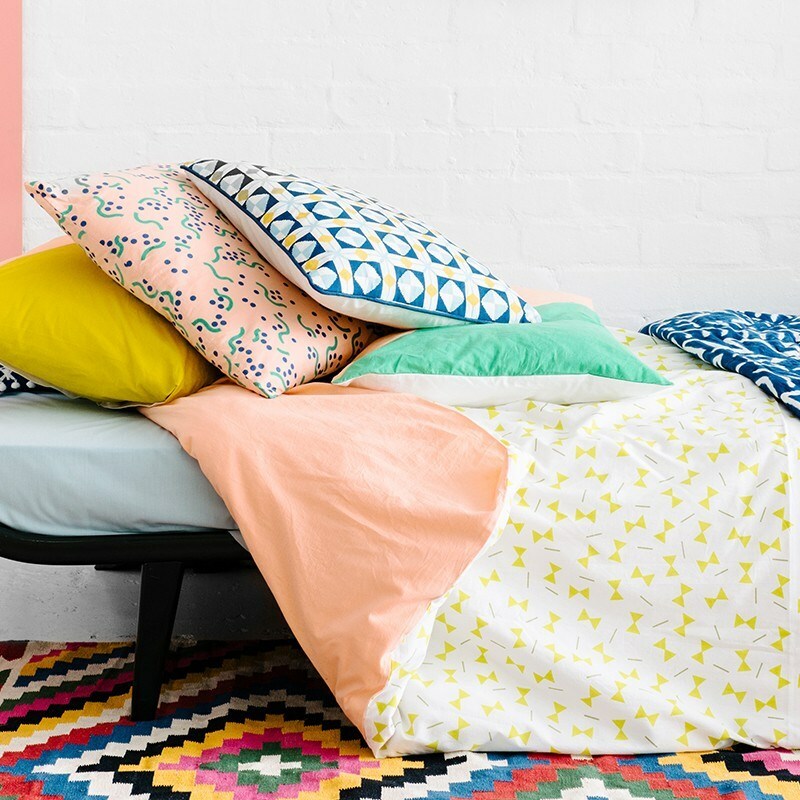 Vivid, geometric bedding is all the rage. 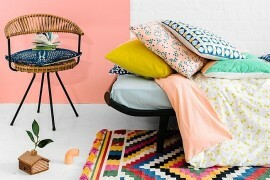 In the next image, we see the Sketchbook Doona Cover from Arro Home. And did you notice that it’s reversible?! Modern trends. Special touches. We’re almost there! 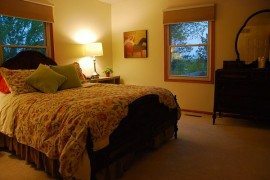 Before I wrap up today’s post, I must call attention to the obvious fact that the bedroom must be a place of comfort. It must beckon you at the end of each day, lulling you into a peaceful sleep. And there’s no better way to induce a deep slumber than with luxe bedding. 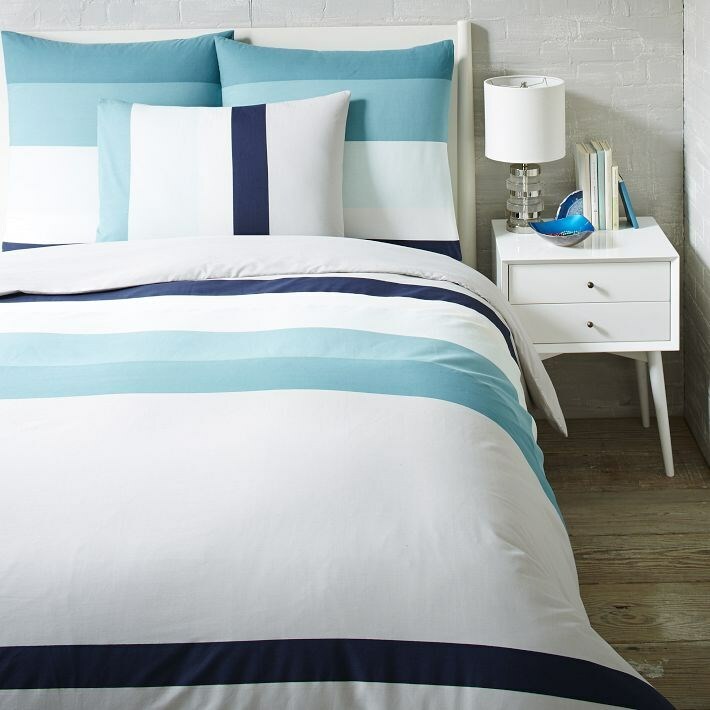 This Stepped Stripe Duvet Cover + Shams set from West Elm looks like it has the power to get the job done! 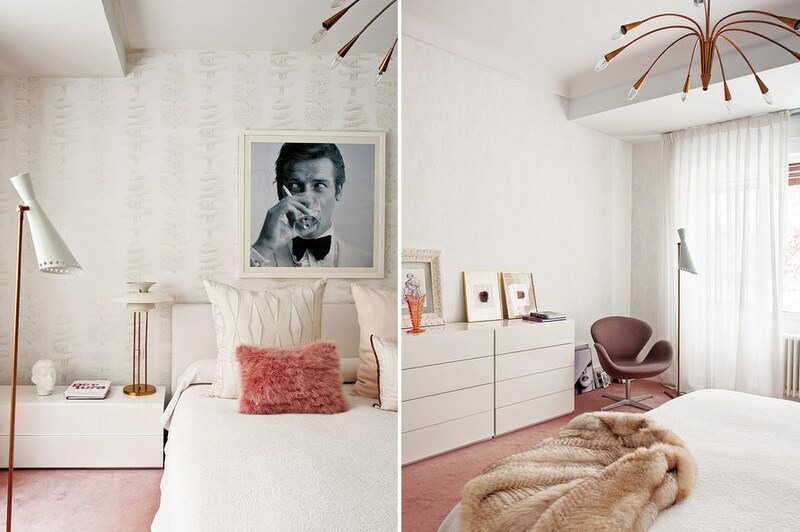 Do you recognize this image from my recent Decoist post on relaxing interiors to indulge in? What’s not to love here?! 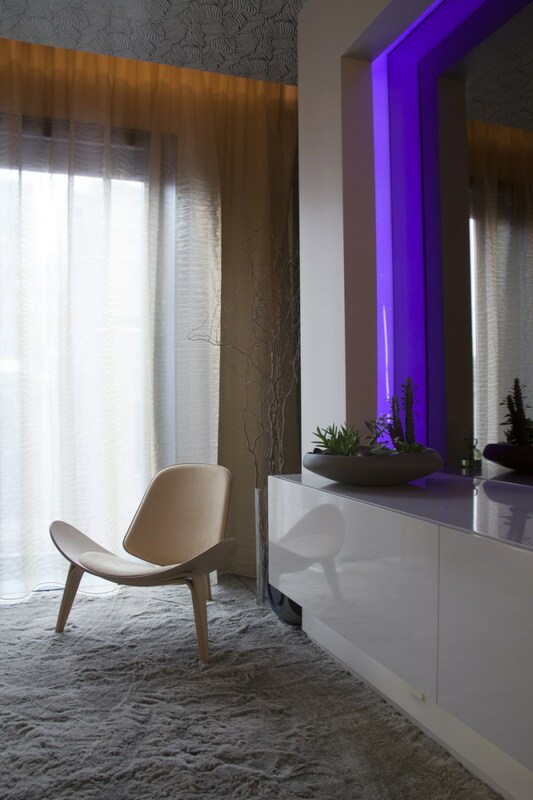 The mood lighting is soothing and alluring. 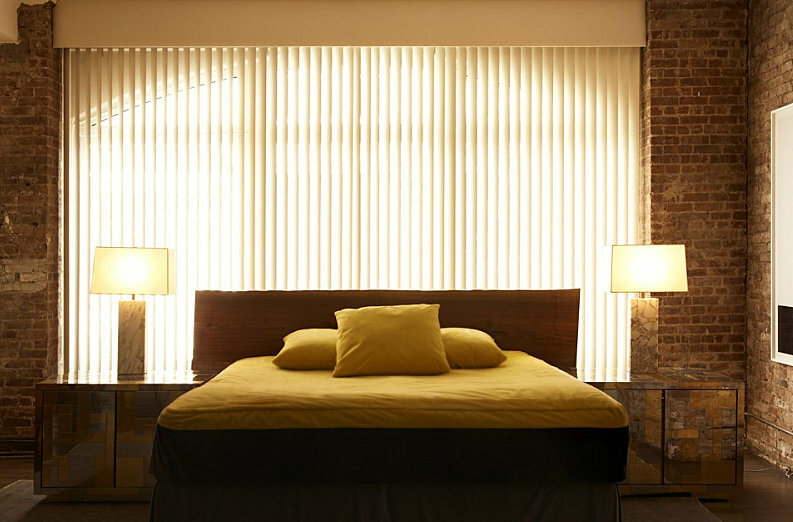 The gauzy draperies let in just the right amount of light. And that plush carpet–don’t you want to walk barefoot over it at this very moment? Did today’s post fill your head (and your Pinterest boards) with amazing design ideas? That was my goal! I can’t wait for my bedroom makeover to unfold. The best part of today’s roundup: these ideas can be carried out on any budget, especially if you’re not afraid to get creative. Check out our DIY projects for some do-it-yourself inspiration. Happy Decorating!